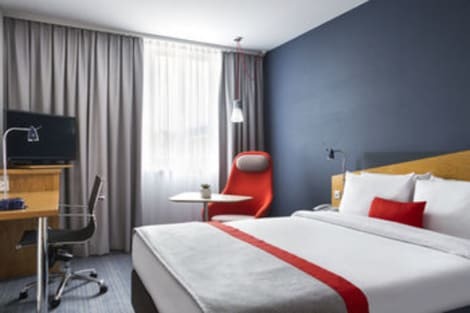 Combining contemporary style with comfort, TRYP Dortmund is located in Dortmund technology park, a short distance from Westfalenhalle and Signal Iduna Park stadium, within easy reach of the city centre. Start the day with a freshly prepared breakfast, dine à la carte in the restaurant, or drop by the bar for a drink and a snack. Each bright, modern room features a private bathroom with walk-in shower and free Wi-Fi. The hotel also has two meeting rooms and an outdoor terrace. Business-friendly hotel in Dortmund city near a U-Bahn station, with breakfast includedHoliday Inn Express® Dortmund hotel is close to Hauptfriedhof U-Bahn station, from where trains zip to the city centre in 20 minutes.We’re just off the B1 highway for direct access to Dortmund, while the A1 and A44 motorways are within easy reach. Dortmund Airport (DTM) is just a 12-minute drive away, and Dortmund Hauptbahnhof station is simple to reach by U-Bahn. Corporate guests are next to Stadtkrone Ost business park and a quick drive from trade fairs at Westfalenhallen Dortmund. Football fans can visit Signal Iduna Park, Borussia Dortmund's home ground, or check out prestigious trophies at the German Football Museum. For culture lovers, modern art is on display at Dortmunder U. In town on business? Our naturally lit meeting room is ideal for seminars and training sessions for up to 30 people.At this hotel you can enjoy:- Inclusive Wi-Fi- Parking at a low daily rate- A 24-hour Business CentreOur thoughtfully designed guest rooms offer ergonomic work areas and comfortable beds with a choice of pillows. USB ports and Smart TVs are convenient for in-room entertainment. An inclusive Express Start™ Breakfast continental buffet is served every morning. In the evening, head to the lobby bar for post-meeting drinks with colleagues. Make yourself at home in one of the 97 air-conditioned rooms featuring flat-screen televisions. Complimentary wireless Internet access keeps you connected, and satellite programming is available for your entertainment. Bathrooms have showers and hair dryers. Conveniences include phones and desks, and you can also request irons/ironing boards. With a stay at NH Dortmund in Dortmund, you'll be within a 10-minute drive of Signal Iduna Park and Westfalenpark Dortmund. 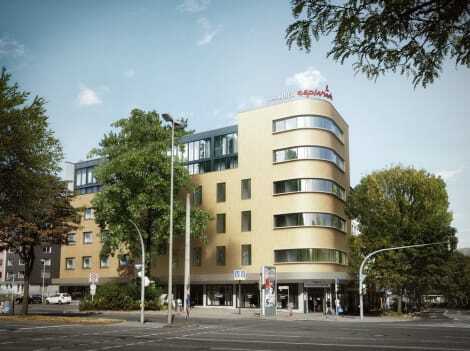 This 4-star hotel is 2.7 mi (4.3 km) from Westfalenhallen and 12.2 mi (19.6 km) from Starlight Express Theater. The modern 4-star Radisson Blu Hotel Dortmund sits by the Westfalenpark, one of the largest urban parks in Europe, and close to the U-Bahn. The chic Restaurant GINGER specialises in Italian, Asian and French cuisines, and you can treat yourself in the on-site bars, or unwind in the Active Club Spa, which has a 24-hour gym, Finnish sauna and pool. Rooms at the Radisson Blu Hotel Dortmund all offer flat-screen TVs, tea and coffee facilities, private bathrooms and free high-speed wi-fi access. Featured amenities include a computer station, dry cleaning/laundry services, and a 24-hour front desk. Limited parking is available onsite. With a stay at Mercure Hotel Dortmund Centrum, you'll be centrally located in Dortmund, within a 10-minute drive of Westfalenhallen and Signal Iduna Park. This 4-star hotel is 12.2 mi (19.6 km) from Starlight Express Theater and 1.7 mi (2.7 km) from Westfalenpark Dortmund. Featured amenities include a business center, complimentary newspapers in the lobby, and dry cleaning/laundry services. Planning an event in Dortmund? This hotel has facilities measuring 2637 square feet (245 square meters), including a conference center. Self parking (subject to charges) is available onsite. With a stay at TOP Hotel Esplanade Dortmund, you'll be centrally located in Dortmund, within a 15-minute drive of Westfalenhallen and Signal Iduna Park. 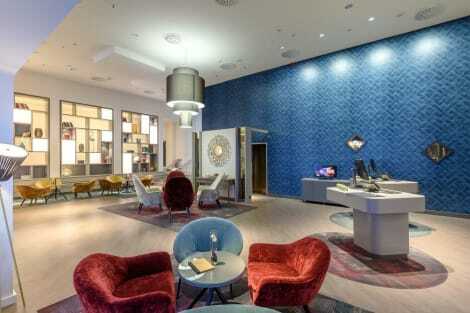 This 4-star hotel is 2.5 mi (4.1 km) from Westfalenpark Dortmund and 13.4 mi (21.5 km) from Starlight Express Theater. With a stay at Novum Hotel Excelsior, you'll be centrally located in Dortmund, within a 10-minute drive of Signal Iduna Park and Westfalenhallen. This 4-star hotel is 11.7 mi (18.8 km) from Starlight Express Theater and 2.2 mi (3.5 km) from Westfalenpark Dortmund. With a population of more than five million, the German city of Dortmund is the largest urban area in the country's Ruhr district. Although built around heavy industry including coal and steel, today Dortmund is better known for its green spaces. Parks, forests, waterways and gardens now cover almost half of the city. We have a fantastic range of Dortmund hotels to choose from, all within easy reach of the city's major sights. The beautiful game is a major passion for residents of Dortmund and the surrounding area. Local team Borussia Dortmund FC have been crowned champions of Germany's Bundesliga a total of eight times, making them one of the most successful teams in the country. Consider catching a game at the impressive Westfalenstadion ground. If you're keen to take in some live music, enjoy an evening at the theatre or perhaps catch some live regional cabaret during your visit to the city, you won't be disappointed. Get tickets for an opera at the Dortmund Concert House, or perhaps see your favourite rock band at the Westfalenhalle 1 arena. Fascinating museums can be found across the city. Try the Apothecary Museum where you can learn all about the world of pharmacy and medicines. Petrol heads meanwhile will love the Motor Car Museum Dortmund, home to a large number of restored cars and motorbikes. Museum Für Kunst & Kulturgeschichte is the place to find everything from Roman gold treasure to paintings by the celebrated German landscape artist Caspar David Friedrich. The Steinwache Memorial is a former police and Gestapo prison that's now dedicated to telling the story of "Resistance and Persecution in Dortmund from 1933 to 1945". To get a better idea of one of the major industries that helped shape the city, pay a visit to Zollern Colliery, a coal mine that began operations in 1902. The site now houses an exhibition which details what life was like as a miner in the city. There are plenty of opportunities in Dortmund to get out into the fresh air. Romberg Park Botanical Garden is one of the largest of its kind in Europe, with 65 hectares of stunning landscape to explore. Westfalenpark is a great destination for families and is known for its impressive rose garden. Visit during December to catch one of Germany's largest Christmas markets, which effectively takes over the centre of town, filling it with craft and produce stalls of all descriptions. Food and drink play an integral role in city life and you'll find an excellent choice of restaurants to enjoy during your visit. Pfefferkorn steakhouse is highly rated for its warm and friendly atmosphere and succulent meat dishes, while you can enjoy fine dining and a modern Italian menu at Acqua Pazza Dortmund. Look out for local specialities such as Salzkuchen mit Mett – a pastry roll filled with pork and onions and topped with salt and caraway seeds. Pfefferpotthast is another local favourite – a peppery stew that goes particularly well with the local beer. Indeed, as Dortmund remains one of Europe's major brewing centres, you must take the opportunity to try one or two of the local ales while you're visiting.